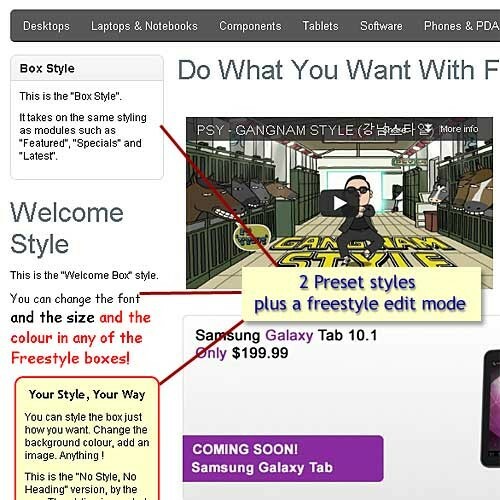 The "Welcome" module allows you to provide an introduction to your store, but there is no real flexibility in it's use. 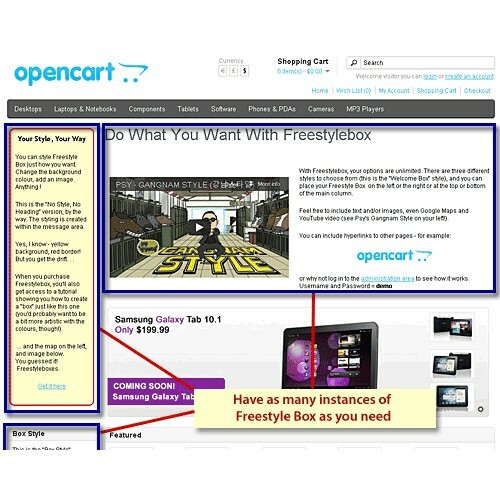 Freestylebox allows the user to choose their own heading for the content, rather than the standard "Welcome to My Store". 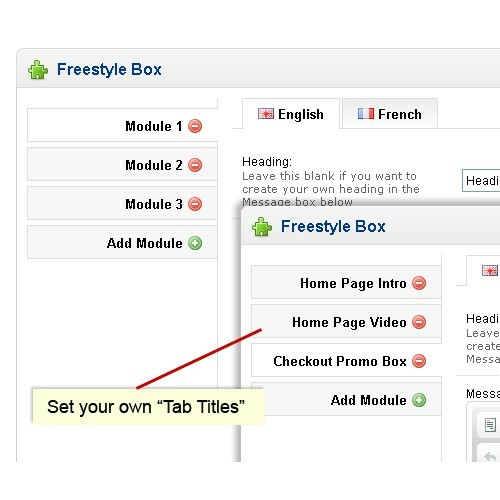 You can choose between, the "welcome" style (similar to that produced by the Welcome module), "box" style (similar to the Featured or Specials modules), or no style which ignores any text in the heading field. And what's more, you can have as many instances of the module on as many layouts as you want ! Checkout the demo to see what's possible! NEW FEATURE Option to set "Code Mode" to bypass CKEditor and the strange things it sometimes does to your html. 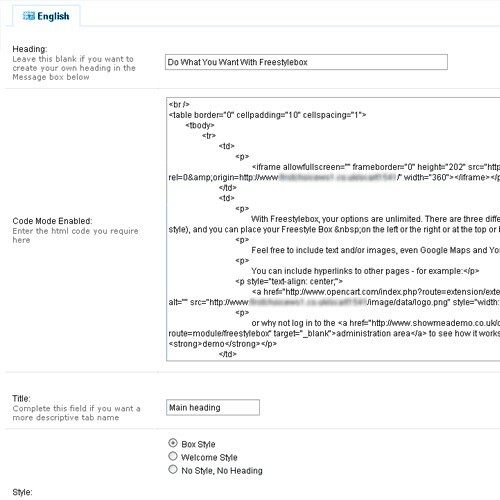 Get the html you want for your page! Any number of additional boxes allowed on as many layouts as you like. 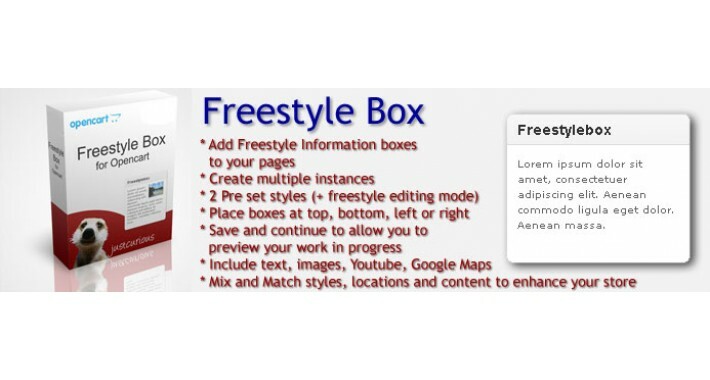 Different heading allowed for each "box"
Will work with most Custom Themes. Guidance on editing the appropriate file (if this is necessary) is included in the download, or contact me if you're having problems. Not currently compatible with v1.5.0.x or earlier. I will create a compatible version if there is a demand for it. Please leave a comment if so. 1. Extract all the files from the zip file. 2. 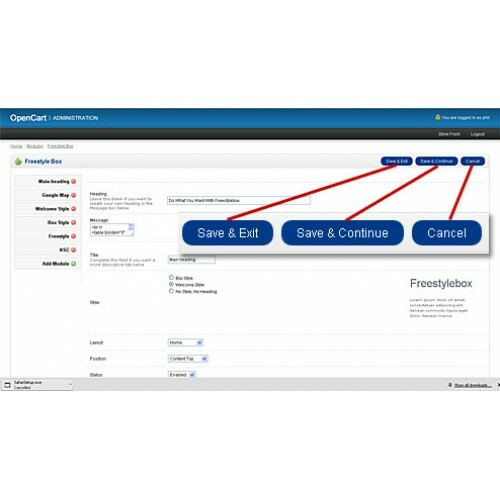 Upload the contents of the "upload" folder to your opencart root directory (nothing is overwritten - it's all new files). 3. Log in to your admin console and click on Extensions | Module. 5. Then click on Edit and you're off.